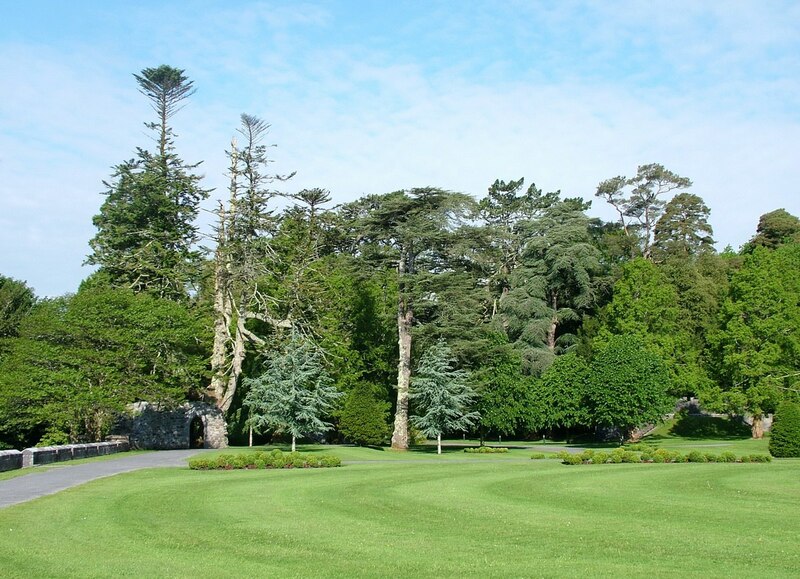 The estate property of Ashford Castle boasts a dense, healthy forest thanks to the efforts of previous owners Sir Benjamin Lee Guinness and his eldest son, Lord Ardilaun. 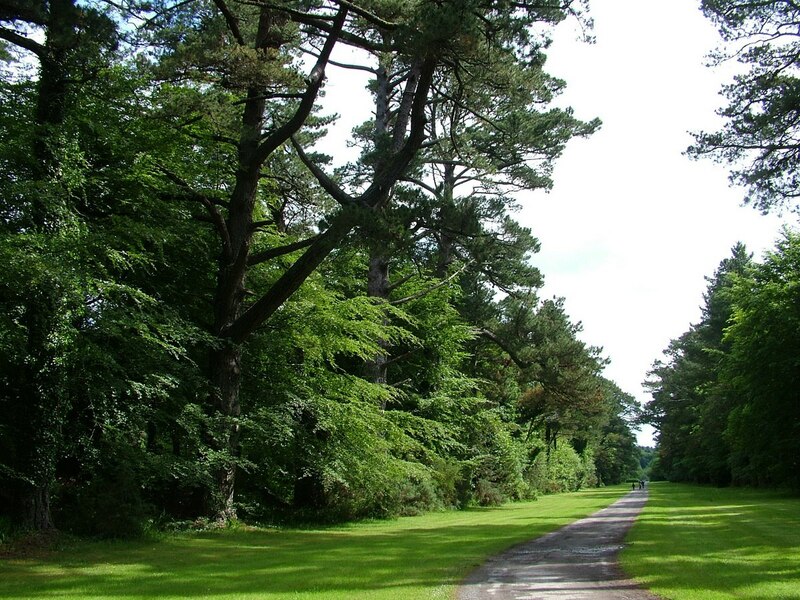 Sir Benjamin had thousands of trees planted during his occupancy of the castle after acquiring it in 1852, and in later years, when the estate passed to Arthur, he expanded the plantings to create extensive woodlands. 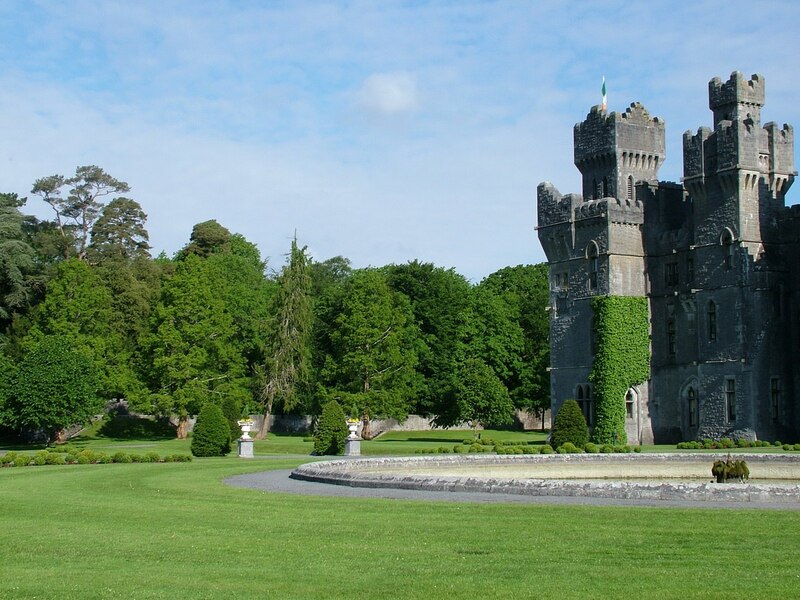 Bob and I had spent a share of our first morning at Ashford Castle exploring the battlements and courtyard adjacent to the sprawling edifice, but then we became intrigued by the many trails said to wander through the woods. That part of Ireland, the Connemara region, is famous for its untamed and beautiful landscapes with their mix of rugged hills, bogs, moorlands, loughs and rivers. Because of the abundance of wildlife in and around Lough Corrib and Cong, we had our hopes high for spotting some new birds. 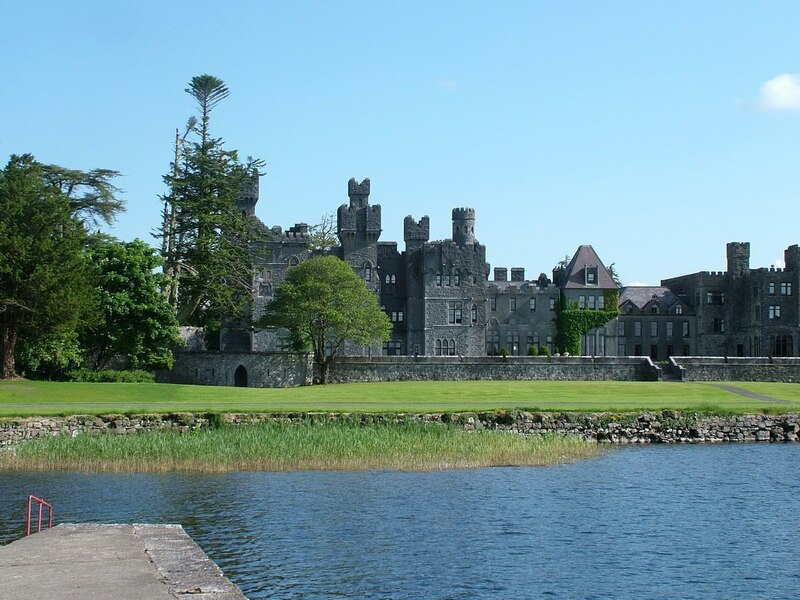 Ashford Castle stands majestically overlooking Lough Corrib, which lies within the Ashford Estate in County Mayo in the Republic of Ireland. The Castle is hidden deep in over 350 acres of wooded parkland, so Bob and I knew we could lose ourselves for hours amidst the trees and plants. 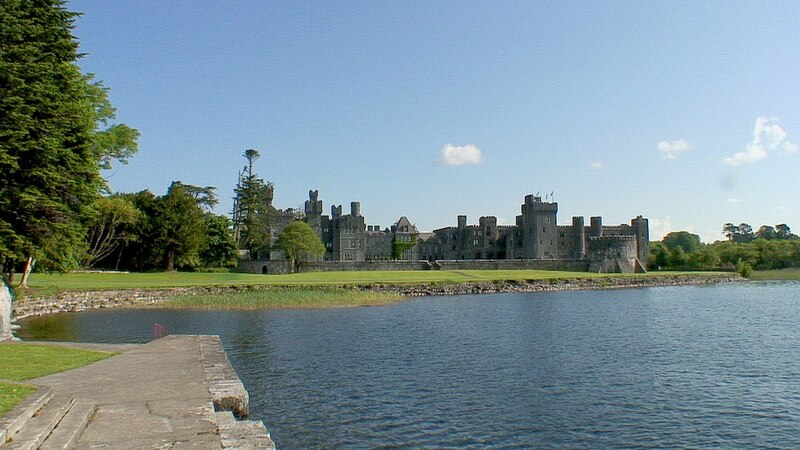 We began by skirting a small section of the shore of Lough Corrib and acquired, at the same time, a dandy view of the Castle from across the water. 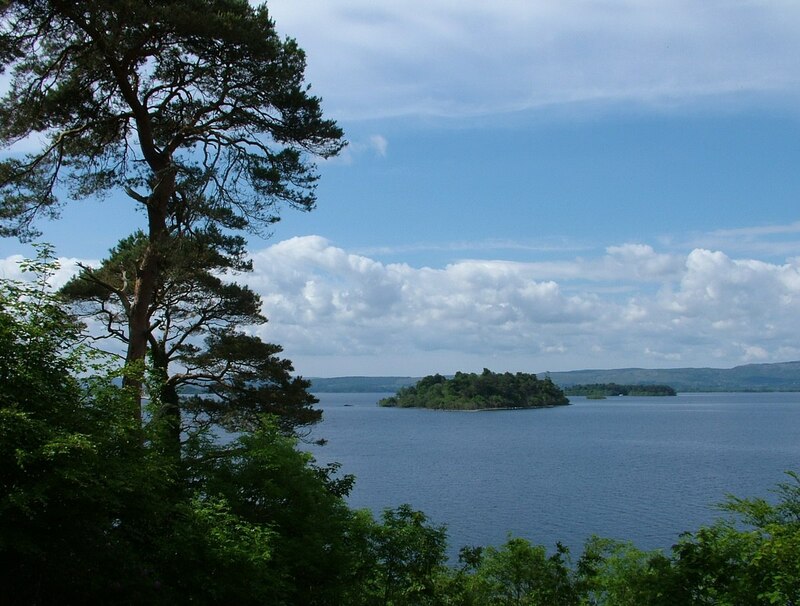 Lough Corrib is the second largest lake in Ireland and the main source of drinking water for the nearby city of Galway. The largest lake on the island of Ireland is Lough Neagh, and it is from near that lake that Bob’s great great-grandparents, and other members of their McCann and McGrath families, emigrated to Canada during the Great Famine of 1847. It was pleasant and very relaxing in the tranquility of the early-morning woods. 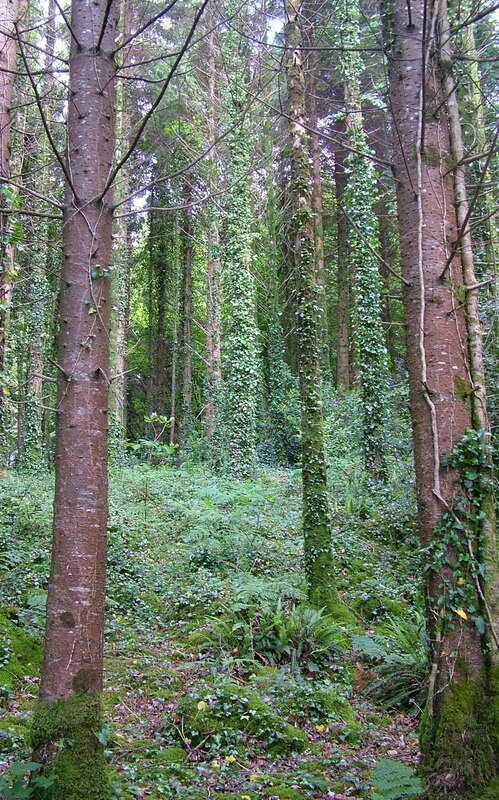 The landscape was lush and green with ivy clinging to most surfaces while the trunks of trees were cloaked in a thick blanket of velvety moss. In one area of the woodlot, a thick growth of bamboo grew to one side of the trail while just opposite, thickets of the now-familiar rhododendrons clambered ever higher seeking errant rays of sunshine. In fact, we were bedazzled with the rampant spreads of rhododendrons on the Ashford Castle estate as well as throughout rural Ireland. 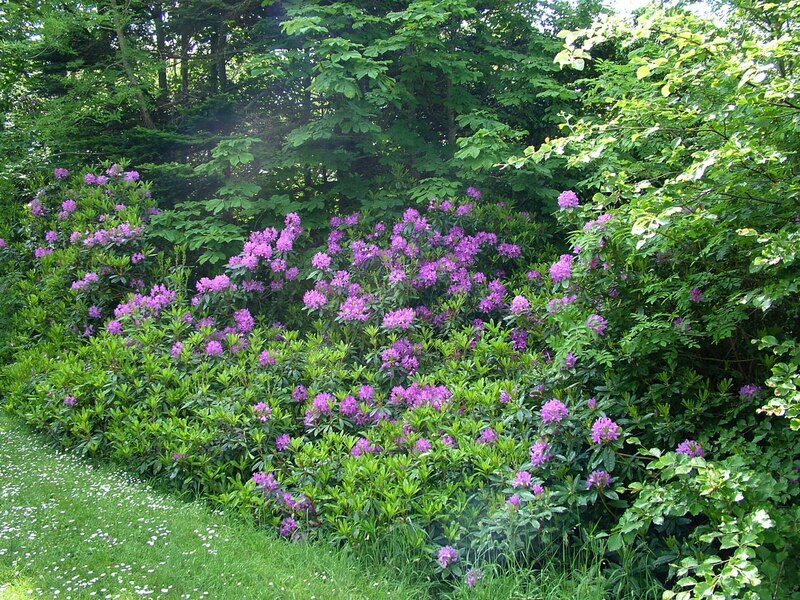 We learned from another pair of walkers, a local couple, that these purple rhododendrons are actually considered an invasive species that was introduced centuries ago by the British. Not having a trail map since one was deemed unnecessary, we just followed our noses whenever there was a junction in the trail. One thing we knew for sure, Lough Corrib was always on our left, and occasional markers pointed walkers towards local destinations or sights. What a surprise to emerge on the side of a high hill overlooking Lough Corrib after we had been hiking for about 1 1/2 hours, and from that vantage point, we had a nice view of some of the uninhabited islands that populate the lake. 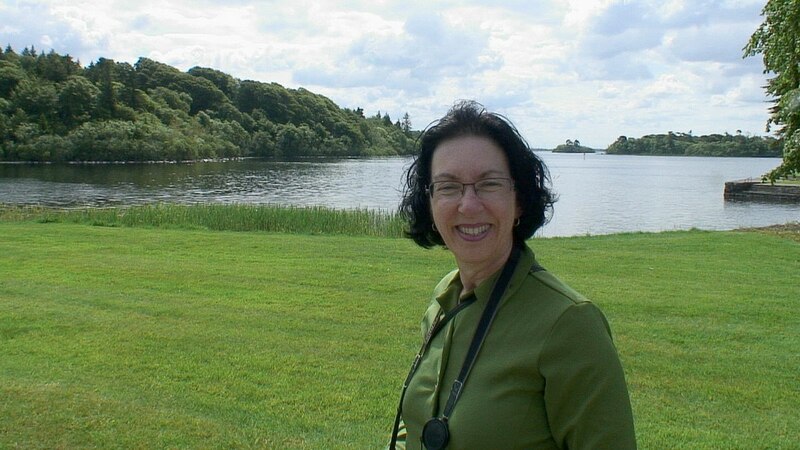 It is interesting to note that Lough Corrib is connected by River Corrib, a very short river, to Galway Bay on the west coast of Ireland. Bob and I were so lucky to be blessed with a warm sunny day for our explorations of the area. 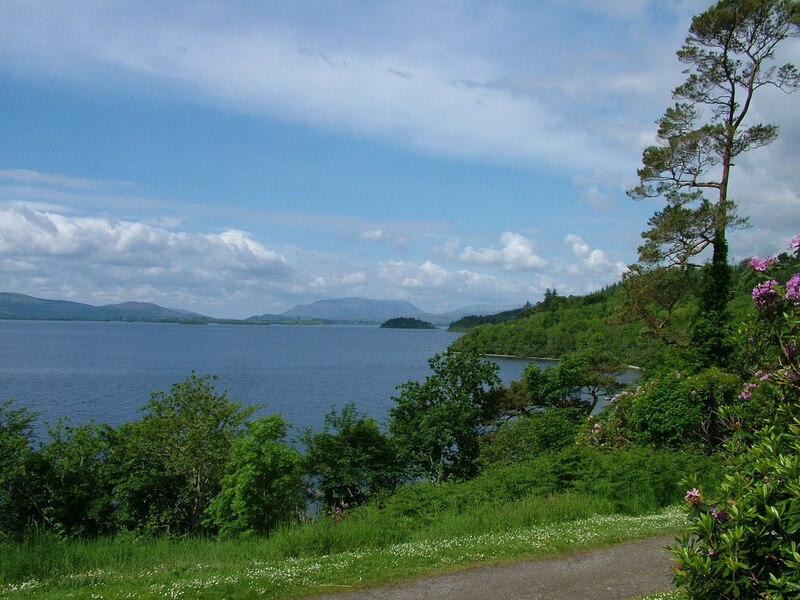 We had plans to also check out Cong, a picturesque village that lies on the shores of Lough Corrib. The word “Cong” means isthmus, and indeed, the village lies on the strip of land between Lough Corrib and another lake, Lough Mask. 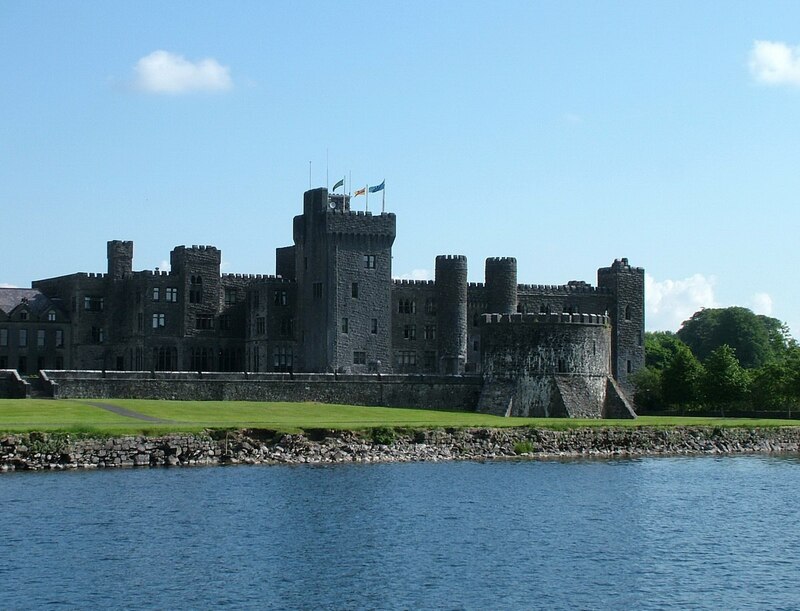 We were fascinated to learn that, during the late 1840s and early 1850s, as a famine relief project, Sir Benjamin Lee Guinness subsidized the building of a canal to link Lough Mask and Lough Corrib. Despite his being pegged as an “improving landlord”, one who actually lived on his estate and contributed to the local economy, that project was a failure. Cong Canal, as it was known, was also called “the Dry Canal” because the underlying porous limestone bed would hold little water. Another initiative, this time financed by Lord Ardilaun, was the operation of several steamboats on Lough Corrib. 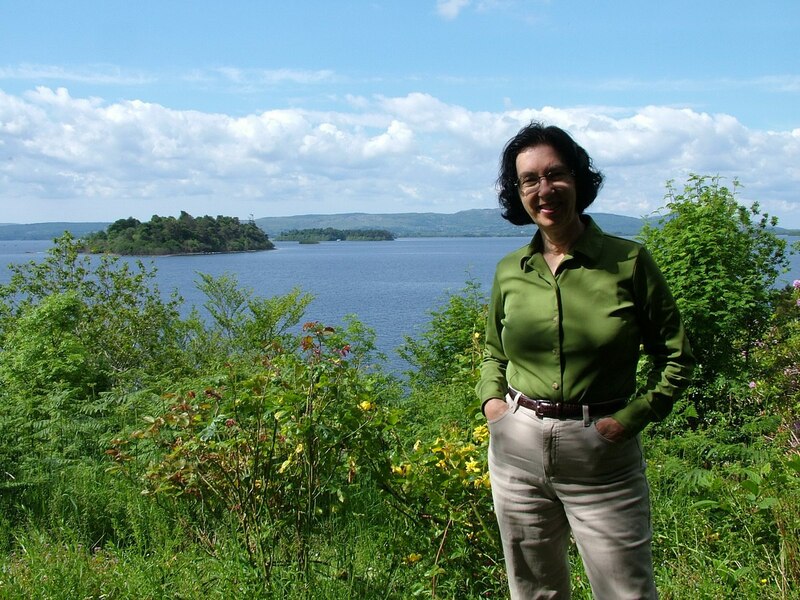 They linked the villages of the Upper Lough Corrib region to Galway City. The most notable of these steam-powered boats was the Lady Eglinton, but it was through the use of all the steamboats that commerce in the area was increased in a time before railways crisscrossed the country. As the sun climbed higher in the sky, Bob and I became aware of acute hunger pangs that saw us heading back towards Ashford Castle to indulge in yet another sumptuous meal. By means of a lengthy circuitous route, we exited from the lush forest glades onto a wide expanse of fresh green grass with a paved walkway disappearing into the distance. We knew we were back on home turf and moseyed along absorbing the peace and quiet of the location. 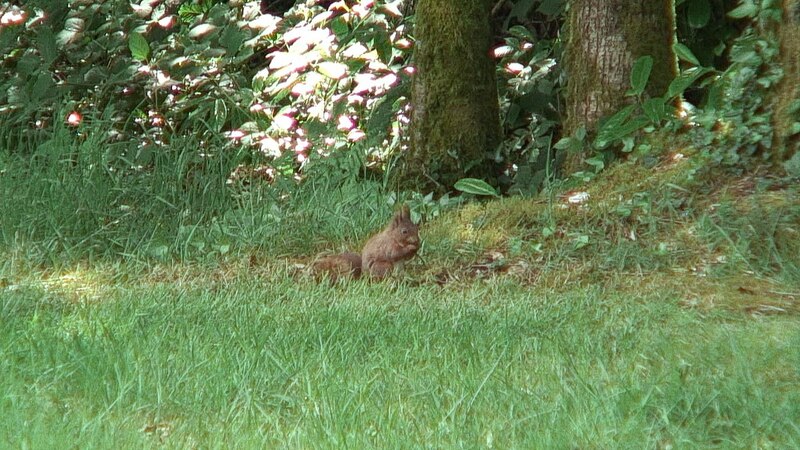 It was along this promenade that Bob and I happened upon a Red Squirrel (Sciurus vulgaris), worth noting because of how rare they are in the Republic of Ireland, and the British Isles. Red Squirrels are so rare in Ireland, in fact, that anyone spotting one of these charismatic native mammals is asked to report it to the authorities in charge of conservation. Go to Red Squirrel Conservation to report a sighting in Ireland. After we were charmed by the Red Squirrel, our attentions were drawn to some very unusual trees that, for all intents and purposes, resembled palm trees with their branches fanning out at the top to create an umbrella effect. 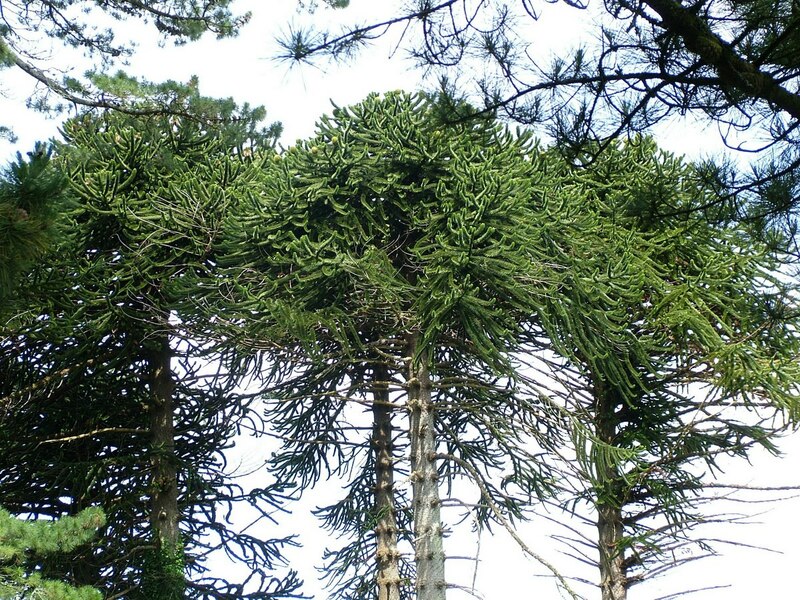 We had seen these same Monkey Puzzle Trees (Araucaria araucana) in both South Africa and England. The name, alone, conjures images of monkeys baffled by how best to scale the trees. 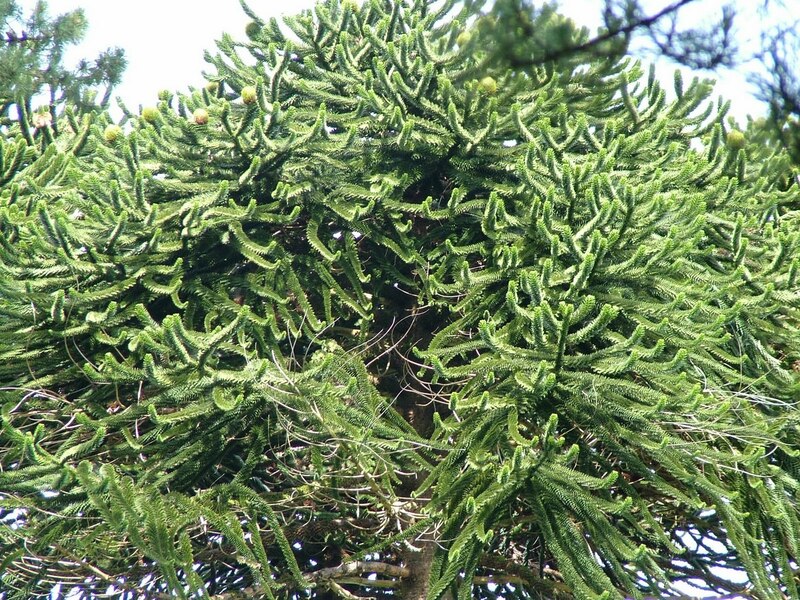 Monkeys are not native to the areas where Monkey Puzzle Trees are indigenous. It was an English gardener who coined the name for the tree upon seeing the thick, tough leaves that look like reptilian scales. It was thought that they would puzzle any monkey attempting to climb the trees, and the name stuck. The triangular-shaped leaves have sharp edges and tips, persist for 10-15 years or more, and therefore cover most of the tree except for the oldest branches. The trees are otherwise known as Chilean Pine even though they are not a pine tree. 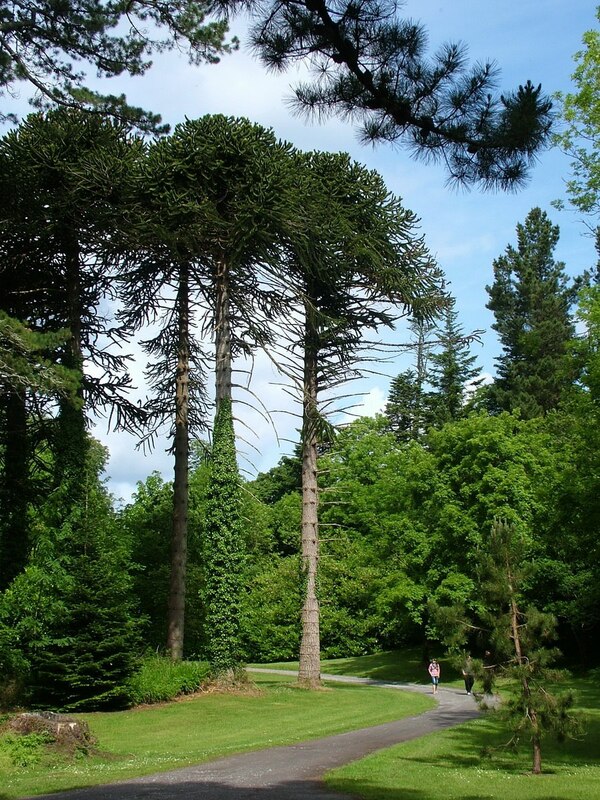 Monkey Puzzle Trees are native to Chile and some parts of Argentina, but Victorians prone to plant crazes had them planted in their gardens all over England and Ireland. The trees, which soar to a magnificent height of 40 metres (130 ft), are the hardiest species in the conifer genus Araucaria. They can live thousands of years and are therefore sometimes described as a living fossil. Monkey Puzzle Trees prefer well-drained and acidic soil, two conditions that abound in County Mayo owing to the prevalence of limestone. Add to that the fact that the cool, wet climate of Ireland resembles that of the Andean plateaux, and you will find, in Ireland, some of the healthiest specimens outside of South America. 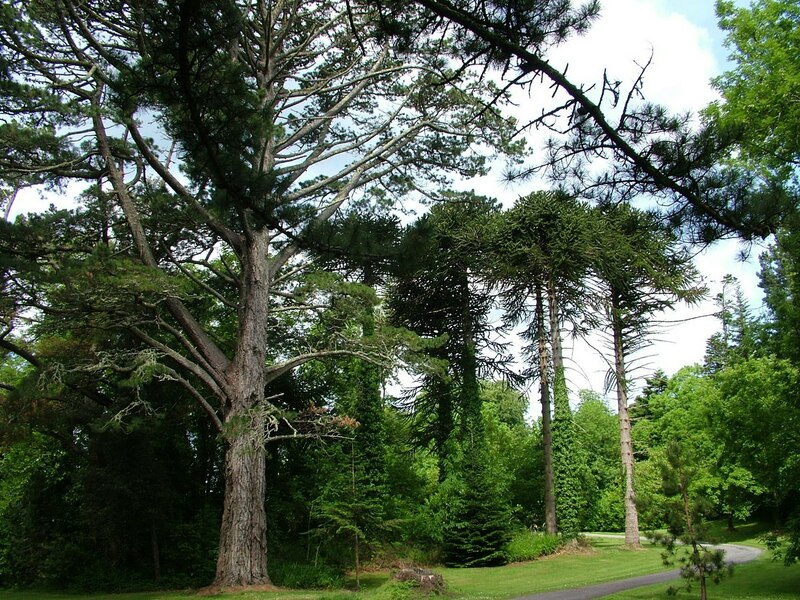 They certainly soared above all other trees on the Ashford Estate. The name, Monkey Puzzle Tree, combined with the unusual character of the trees, captures the imagination of anyone who sees them. 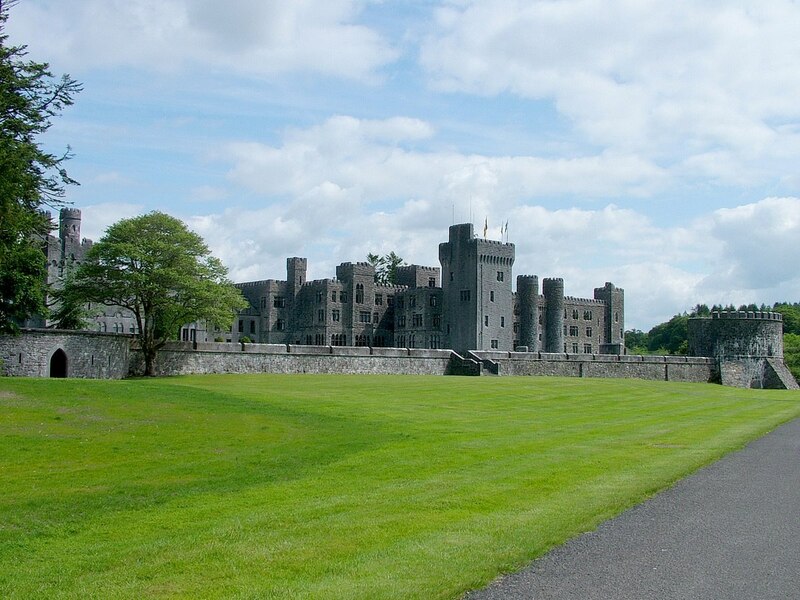 The commanding silhouette of one tree looms over Ashford Castle illustrating how these trees are visibly recognizable from even a great distance. By the time Bob and I arrived back at the castle, we were ready to sequester ourselves in The Drawing Room for a much-deserved lunch before continuing our exploration. 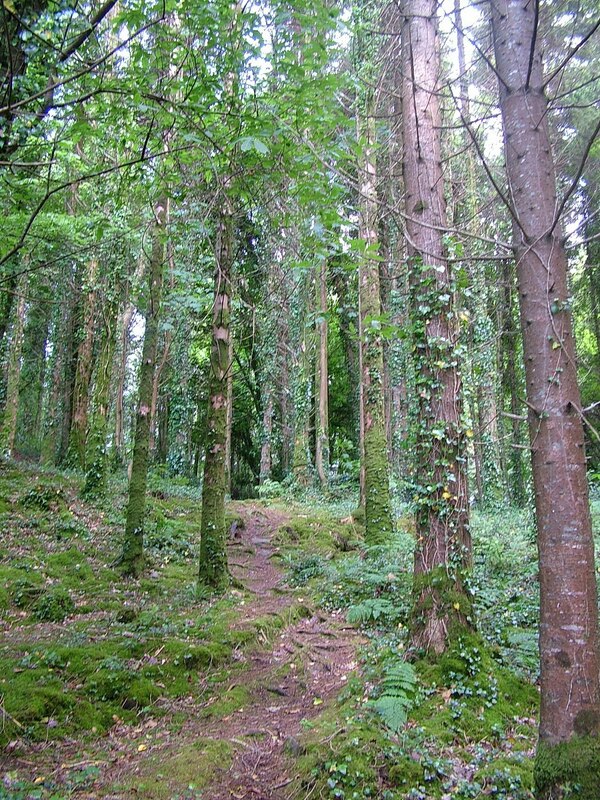 We planned to walk the shady trails into Cong and explore historic Cong Abbey.